Womens Care Consultants – Dr. Maria (Gigi) Maminta-Streiff, M.D. 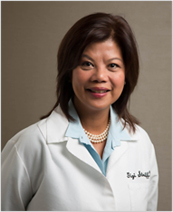 Dr. Gigi Maminta-Streiff has served the community through her OB-GYN practice for the past 24 years. After delivering babies for many years, her primary focus has recently shifted to Gynecology. Dr. Streiff was originally born in Manila, Philippines and immigrated with her family to St. Louis in the 1960’s. She is proud to have been raised in St. Louis, growing up in Brentwood and Chesterfield. Her bachelor’s degree was received from “Mizzou”, the University of Missouri-Columbia. She then returned to the Philippines for medical school. She completed her residency and graduated with an honor of “most compassionate” resident from St. Louis University Medical school. Dr. Streiff is a Fellow in the American College of Ob-Gyn and serves on the volunteer faculty of Washington University School of Medicine. Dr Streiff’s practice focus is now gynecology. Her special interests include female health and wellbeing, menstrual irregularities, preconceptual care, polycystic ovarian syndrome, uterine fibroids, abnormal Pap tests, perimenopausal and menopausal symptoms, as well as bio-identical hormone therapy. She has considerable experience with the newest contraceptive technologies, endometrial ablation, minimally- invasive laparoscopic hysterectomies and laparoscopic removal of ovaries, including DaVinci robotic surgery. Dr. Streiff thanks the women of St. Louis and the surrounding communities for their continued support of her practice, it continues to be her passion and honor to serve as their physician.